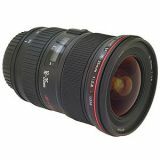 I use this lens on my 5D since many years, and now I'm uncertain if I have to buy the new II version. The new version seems better for sharpness in the corners and vignetting wide open, while this version needs to be stopped down for perfect results. I always follow the rule "upgrade your brain first, then your equipment". One thing I have found is you need to work from f8.0 to f16 for great results from this lens. a great lens, not heavy as someone posted,with only one noticeable flaw : used at 16mm you will notice vigneting around the corners if used on a film camera or on a eos 1ds mk2.also remember not to use any filter when going to 16 mmm it also causes vigneting. Fantastic wide-angle zoom. Love it.